Smashed houses, fallen trees and streets littered with debris greeted us when Greenpeace arrived in Dolores, Eastern Samar, on Tuesday after Typhoon Hagupit made a direct hit on the seaside town. Much of the region's crops had been destroyed and 7,000 people from a total population of 40,800 were still living in evacuation centres, unable to return home. City authorities struggled to distribute emergency food and clear the streets. 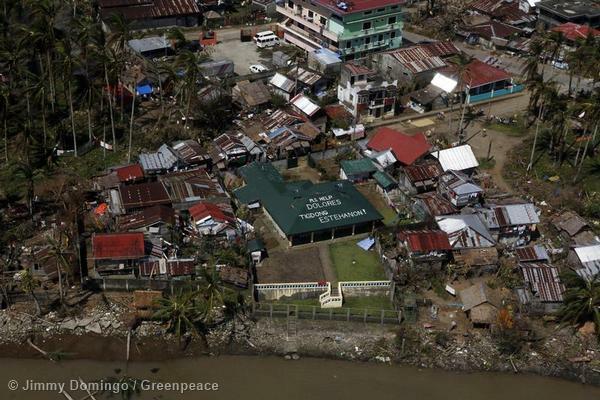 Greenpeace International Executive Director Kumi Naidoo visited the town, together with Philippines climate change commissioner Naderev 'Yeb' M. Sano and Greenpeace Southeast Asia Executive Director Von Hernandez, two days after the typhoon struck. Together they brought a message of solidarity to a remote and isolated community, cut off from the rest of the country and left with no electricity or mobile phone service and where dozens of shouting children swarmed around as we arrived in town. The town hall, where emergency bags of rice were stored, was a hive of activity as Mayor Emiliana Villacarillo co-ordinated relief efforts. Damage assessments were collected on white boards, water quality testing recorded and relief donations listed by authorities. Children and adults spoke of the fear and anxiety they had felt, but in their pain and suffering a strong sense of community thrived. It was the same feeling we had witnessed the day before in the town of Laiya on the other side of the country. In Laiya, as the eye of the storm made a direct hit on the town, we had gathered with locals at a national school used for the first time as an evacuation centre. As darkness fell, panicked parents raced to bring their children to the school and a church as chaotic Hagupit unexpectedly moved further north, directly threatening this poor, hardworking community. Several hundred people congregated at the school, sheltering from driving rain and wind. In this hour of need, they shared everything, ate communal meals and settled children down on makeshift beds on cold, hard concrete floors. Amid the constant chatter, torches lit up the darkness, cars came and went with more evacuees, motorbikes rumbled and the rain splattered into the mud. The beach was close, but the evacuation centre far enough away from the potential storm surge. Laiya is a village of bamboo huts built on the sand, but no one had gone fishing that day. The community was just one of many to have been evacuated in the path of Typhoon Hagupit as it crawled across the Philippines with powerful gusts of wind and rain. Just weeks before Christmas when the population had festivities on their mind, the typhoon displaced 1.2 million people as one of the biggest peacetime evacuations in history was co-ordinated due to the improved planning of the Philippines government. Fearful of a similar tragedy like Super Typhoon Haiyan, when close to 7,000 people were killed, the Philippines had been on red alert for days. Prior to the typhoon's landfall, I'd seen army trucks on the southern island of Bohol stationed outside of town with sacks of rice ready to distribute. Elsewhere, farmers prepared to offer seeds to help farmers in the typhoon's path to replant damaged crops. Hagupit was the most powerful storm to hit the country this year and came during the UN climate talks in Lima -- an uncanny coincidence given Typhoon Haiyan and Typhoon Bopha also hit the country during the climate negotiations in the past two years. The Philippines is disaster-weary, hit year after year by typhoons on steroids, strengthened by climate change caused by the world's use of oil, coal and gas. These communities can ill afford the constant damage, but they are strong and proud, happy people. Their sense of community is heartening but also heartbreaking. As the storm hit the town of Laiya, a brave 12-year-old girl in a darkened church with no electricity said to me: "We are always smiling because we want to express that we are strong even though there are so many disasters that are putting us down." But she should not be forced to put on such a brave face. The country does not deserve this and something must be done. In the words of Greenpeace's Kumi Naidoo it is time for climate justice. "Looking at the sense of community and the sense of solidarity here, we must ask the question, who compensates them for what they are going through? When we call for climate justice, we are saying we must respect the polluter pays principle. This means that those who benefit from carbon pollution like the oil, coal and gas companies must step up and help communities and pay for the damage they have caused. If we do not, we will not be respecting a basic sense of justice and accountability." 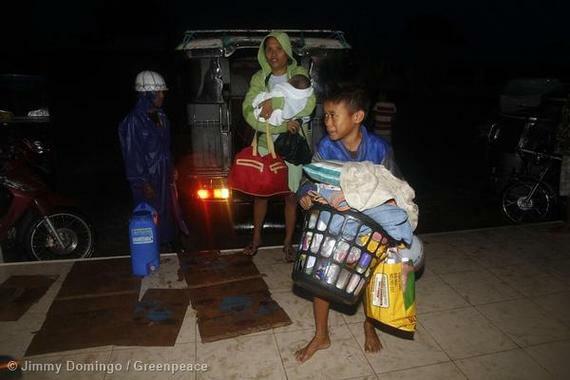 To put it another way: it is an injustice that the Philippines is repeatedly paying the price of climate change. It's an injustice that must ultimately end with climate justice.